1. Location : ILJIN Composites is located in Jeonju, South KOREA. 2. Type of organisation : Manufacturer of TYPE 4 Composites high pressure cylinder. : Established in 1999, ILJIN Composites is one of the affiliated companies of ILJIN Group, which is the materials and component manufacturer in South KOREA. ILJIN Composites' Type 4 cylinders are manufactured based on structural analysis through optimal design using carbon fiber and HDPE liner approved in accordance with the standard of NGV2-2007(N. America), ECE R110(Europe), ISO 11439(Global), EC79(700bar, Hydrogen tank), and ISO 11119-3 (Gas transportation). 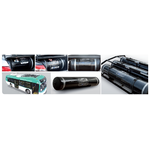 : All parts of Composites cylinder manufacturing such as Design, Production, and test. : Type4 Composites high pressure tanks for CNG and hydrogen. : For CNG Bus, CNG Truck and Fuel cell Vehicle.